Many people consider summertime to be their favorite season, and why wouldn’t they? The temperatures are higher, the days are longer and the sun is brighter. Summer brings a multitude of recreational activities to choose from and, overall, a more relaxed way of living for a little while. However, increased fun in the sun means an increased risk for skin cancer. Myth: Sunscreen use is reserved primarily for the beach and outdoor activities. It’s very easy to get a sunburn on exposed skin during long car trips or even sitting near an uncovered window for a certain period of time. You never know when you may be stuck in traffic or decide to go for a long walk during lunch, so putting on sunscreen or lotion with UVA and UVB protection as regularly as deodorant is a habit you will thank yourself for later. A common recommendation for sun safety is to avoid going outside between 10:00 AM and 4:00 PM, the time frame in which the sun is at its most powerful. However, on a warm, cloudless Saturday afternoon, that’s much easier said than done. 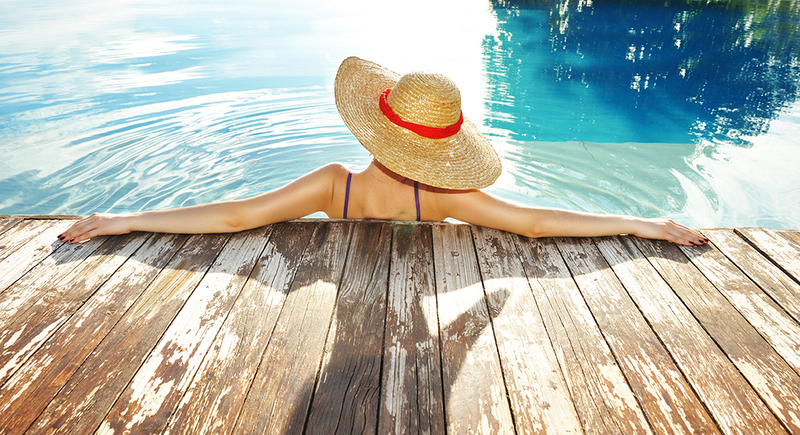 So, in addition to applying sunscreen, try to wear long sleeves, pants and wide-brimmed hats as often as possible. When it’s too hot for these items, take advantage of shaded areas for as long as you can. Skin cancer does not discriminate, but there certainly are factors that increase a person’s risk. In addition to increased UV and UVB ray exposure, risks prove higher in individuals that suffered severe sunburns in the past, those with fairer skin and hair, those with a family history of skin cancer, prevalent moles or a weakened immune system and those living in sunny or high-altitude areas. Caucasians and men 50 years or older are at a higher risk for developing melanoma than the general population. However, outcomes regarding skin cancer vary in Caucasians and people with skin of color. Individuals with skin of color often receive a skin cancer diagnosis in later stages, after it becomes more difficult to treat. They are also more prone to skin cancer in areas less exposed to the sun, including the palms of the hands, soles of the feet, the groin, under the nails, as well as the inside of the mouth. Despite all the negative coverage tanning beds have received in the media in recent years, tan lines and sun-kissed skin is still praised almost everywhere we turn; ranging from social media to popular songs on the radio. It’s no wonder there is still a debate whether tanning beds are safer than natural sunlight. The fact is that that both tanning beds and natural sunlight expose individuals to harmful UV rays. Not only can UV rays cause skin cancer, but prolonged exposure can lead to premature skin aging. Simply put: there is no such thing as a “healthy tan.” However, we can’t ignore the multitude of people who claim they feel more confident with a tan, so opting for a sunless tanning product from the drug store is a safer way to get a tan all year long. An essential step in skin cancer prevention is regular screenings. Dermatologists can assess and recommend how often a person needs a skin exam based off personal risk factors. It is recommended that individuals with a family history of melanoma or other skin cancers should have a full-body exam at least once a year. Another beneficial habit is monthly skin self-exams to check for new or changing moles. Approximately half of melanomas are self-detected. The best kind of fun is fun that we don’t regret having. Melanoma cases have increased in the last 50 years in the United States and in most countries with fair-skinned individuals. Skin cancer prevention is just one way that you and your loved ones can stay healthy and enjoy many summers for years to come. After all, our skin is the largest organ on our body, so why wouldn’t we prioritize its health as much as other parts of our body?